What is a System Tray. How StoryServer uses the System Tray Area. What is a System Tray? Introduced with Windows 95, the system tray is located in the Windows Taskbar (usually at the bottom next to the clock) and contains miniature icons for easy access to system functions such as fax, printer, modem, volume, and more. Double click or right click on an icon to view and access the details and controls. What does StoryServer do in the System Tray Area? StoryServer minimizes and maximizes itself to and from the system-tray area. 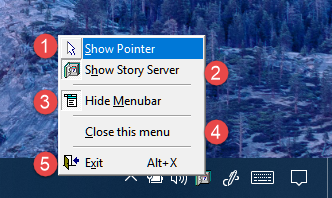 When you right-click on the StoryServer icon, a popup menu appears. The below describes the popup-menu functionality. Shows or hides the main UI interface. Shows or hides the Menu-bar.